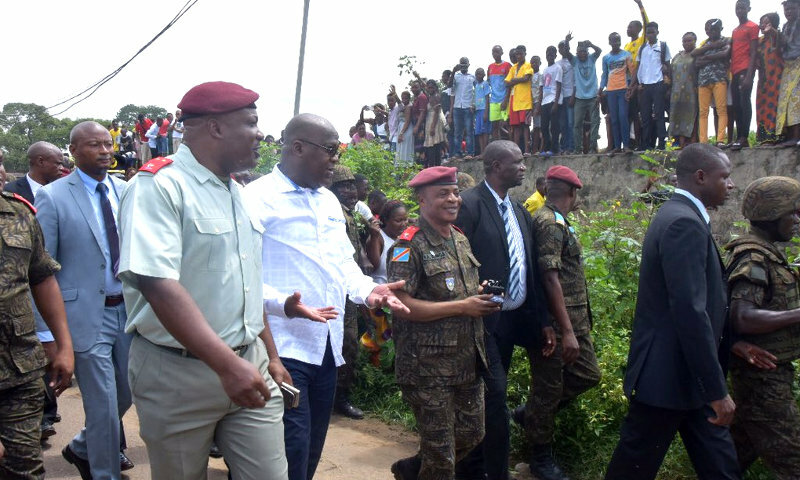 Kinshasa 05-02-2019 Politics - The President of the Republic, Supreme Commander of the Army Forces of the DRC (FARDC) and the Congolese National Police (PNC), Félix Antoine Tshisekedi Tshilombo, on Monday visited the Colonel Tshatshi camp, in Kinshasa, to become saturated about the living conditions of the military and their dependents. Speaking on this occasion to the Republican Guard, he said that his visit was intended to make the inventory of the barracks, to improve the living conditions of men who serve under the flag, such he promised during the election campaign. This short speech galvanized the morale of the fighting units and their families which gave him a warm welcome. Under the supervision of the commander of the Republican Guard, the Head of State successively visited the medical center, the primary school I and II and the Technical Professional Institute of Tshatshi camp. Wherever he went, he spoke with the various service managers who presented him with the difficulties of which they are facing. Upon his arrival, the Head of State was greeted by the commander of the Republican Guard, Major-General Ilunga Kabamba Kapete and the staff of this unit of protection, before receiving the honors and greeting the troops. He then attended a military parade organized for this purpose.